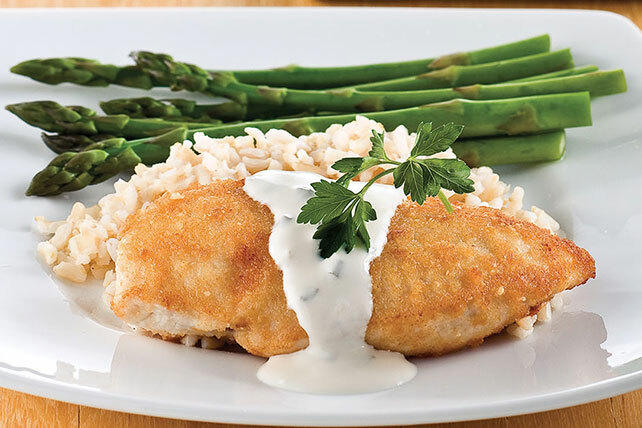 Enjoy our delicious Parmesan-Crusted Chicken in Cream Sauce. Once you've have ours, you'll never go back to another parmesan-crusted chicken recipe again. Cook rice in 1-1/4 cups broth and 1/2 cup water as directed on package. Heat oil in large nonstick skillet on medium heat. Add chicken; cook 5 to 6 min. on each side or until done (165°F). Transfer to plate; cover to keep warm. Add remaining broth and reduced-fat cream cheese to skillet; bring just to boil, stirring constantly. Cook 3 min. or until thickened, stirring frequently; spoon over chicken. Serve with rice and asparagus.